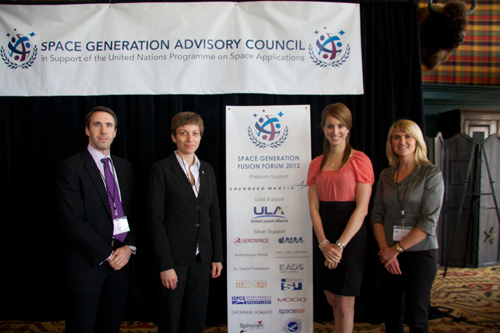 March 2012 – International Launch Services (ILS), as a member of the Washington Space Business Roundtable (WSBR) and working with the Space Generation Advisory Council (SGAC), participated in sponsoring two scholarships for young leaders of the Washington, DC area to attend the inaugural Space Generation Fusion Forum and the National Space Symposium in Colorado Springs, USA. The winners – Heather Duckworth and Kris Lehnhardt – demonstrated extraordinary capability in their careers, extracurricular activities and visualization of future goals. Heather holds a Bachelor in Astrophysics from Columbia University, and looks forward to beginning graduate school for Aerospace Engineering at either Caltech or Stanford this autumn. She is a NASA Ames Academy Alumni and Staff, and has previously worked at the SETI Institute. On the East Coast, Heather has spent time at Hayden Planetarium at the American Museum of Natural History in New York City, and SpaceWorks Commercial in Washington, DC. In addition to her studies and research, Heather is a professional dancer, where she has performed as a Radio City Rockette, and on the Broadway National Tour of A Chorus Line. She hopes to one day make a difference in aerospace as a mentor and a leader. Dr. Kris Lehnhardt is an Attending Physician and Assistant Professor at George Washington University, where he specializes in Emergency Medicine and Aerospace Medicine. He is the director of “Introduction to Human Health in Space”, a new graduate course designed to teach students about the challenges of humans living and working in space. Dr. Lehnhardt is also a Major in the reserves of the Royal Canadian Air Force, a Flight Surgeon for the Mars Desert Research Station (owned and operated by the Mars Society), and a Flight Member with Astronauts4Hire. WSBR is a leadership forum for the promotion of commercial space business and education in the National Capital area. As a non-profit, membership-based group, WSBR supports the open exchange of ideas and information among a broad range of executives, government policy makers, lawyers, insurers, analysts, academics and thought leaders involved in the business of space in the metropolitan Washington region. SGAC works on the international, national and local level to link together university students and young professionals to think creatively about international space policy issues and inject the youth point of view into international space policy creation. In February of 2012, SGAC and WSBR signed a memorandum of understanding to solidify their relationship. ILS is a world leader in providing launch services for global satellite operators offering a complete array of services and support, from contract signing through mission management and on-orbit delivery. ILS has exclusive rights to market the Proton vehicle to commercial satellite operators worldwide and is a U.S. company headquartered in Reston, Va., near Washington, D.C. The Space Generation Advisory Council presents the inaugural Space Generation Fusion Forum – a US space event highlighting international thinking geared towards university students and young professionals. The event aims to gather a competitively chosen group of up to 50 top young adults from various areas of space – government, industry, and academia. Intense, interactive panel discussions among selected young adults will be moderated by today’s international space sector leaders and will gather the perspectives of tomorrow’s space leaders on key space issues.